A good pool contractor always designs to suit the user. But the swimmers in this pool would have a very different profile. Ed Fletcher, vice president of the commercial division for Presidential Pools, Spas and Patio, was approached by local firm Deutsch Architecture Group about building a pool for dolphins. This wouldn’t be the first for the customer — or for Fletcher, who built a dolphin pool in the 1990s. But this project had a different twist. Meant to increase the appreciation of dolphins and promote ocean conservation, the Dolphinaris park would include pools where humans could interact with our fellow mammals in the water. 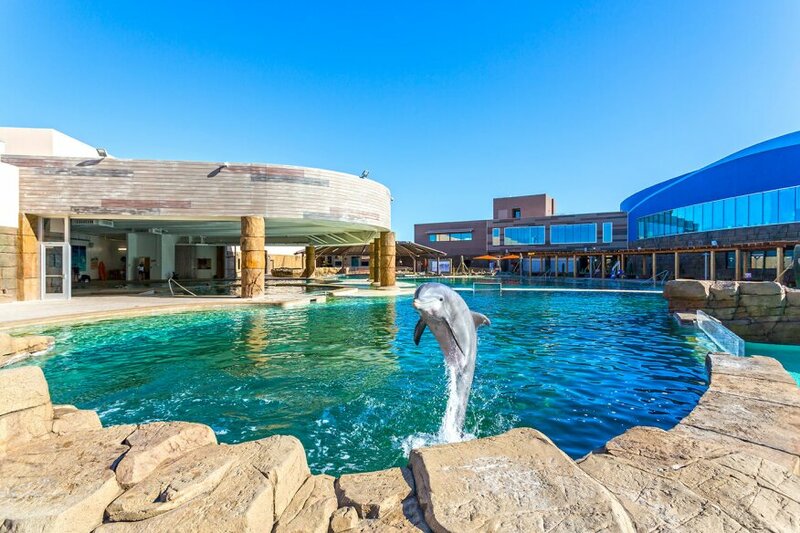 Visitors can interact with the dolphins from dry land, inside the pool, or even serve as dolphin trainers for a day. There already existed six Dolphinaris properties in Mexico, but this would be the first in the U.S. The resort opened last year. 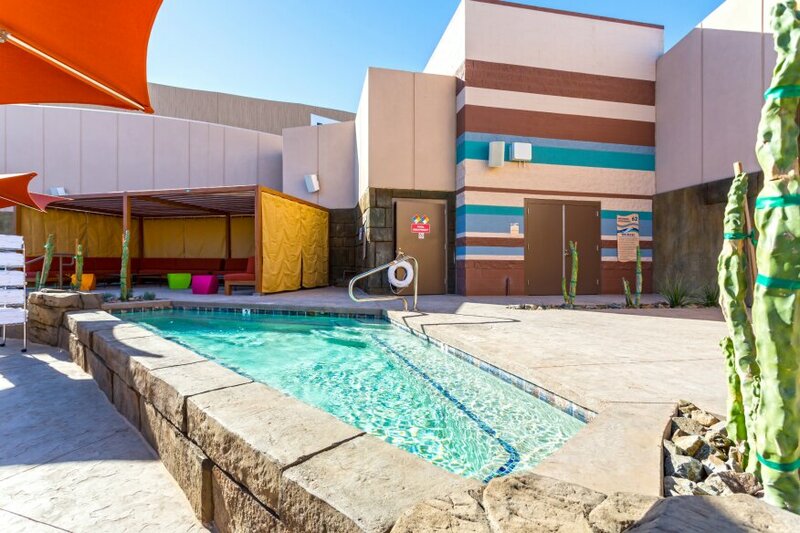 Presidential, a PSN Top 50 Builder located in Gilbert, Ariz., is happy to have added another type of project to its portfolio. But it had to learn about dolphins and their physical needs, then translate that into the design and construction of the pool. 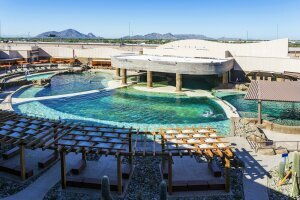 Additionally, the technology used in Mexico — all on beachfront properties where seawater could be used — had to be adapted for an inland community in one of the most treacherous deserts in the U.S.
With some direction and specifications from other experts, including some supplied by Dolphinaris, the company was able to build a pool fit for these creatures. While dolphins are charming, their systems for processing nourishment aren’t. These animals eat approximately three times the amount of food as humans, so they generate a lot of waste. A system had to be engineered that would aggressively clean and filter the water to sustain life. 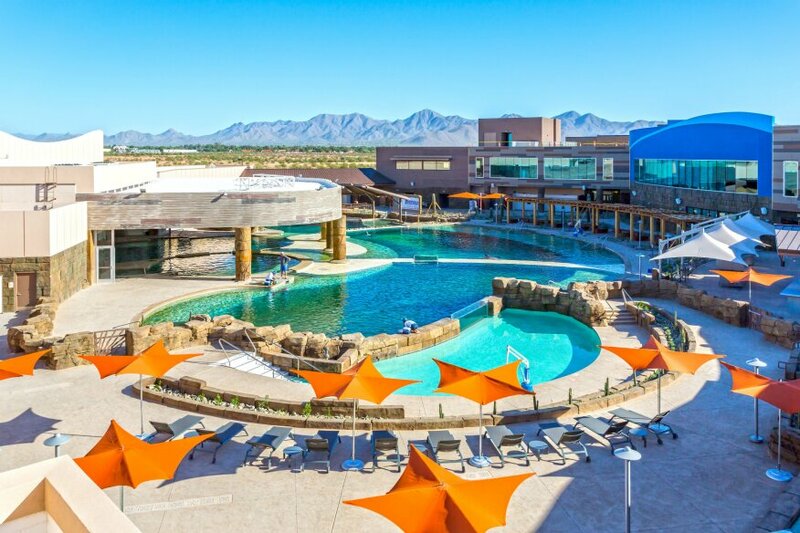 Combined, the pools contain about 1 million gallons, which can be turned over in approximately 90 minutes, thanks to a system that moves 10,000 gallons per minute. Of course, the animals can’t survive in chlorinated water. 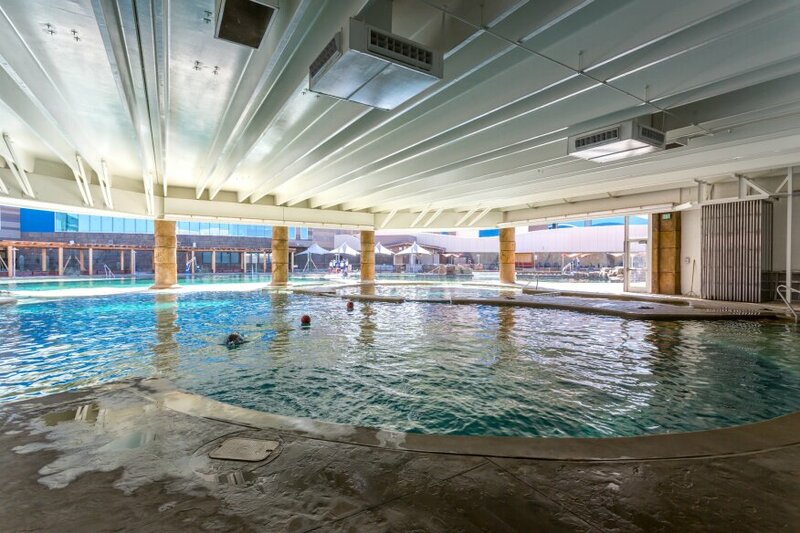 The pools are outfitted with a saltwater system for marine life — not the salt chlorine generators in standard pools. Water is filtered by protein fractionators to rid waste and particulate. Specified by Dolphinaris experts, this technology can filter out particles as small as 4 or 5 microns. The use of a salt system meant no metal parts could be placed in the pool. “Or it would be gone in six months or less,” Fletcher says. 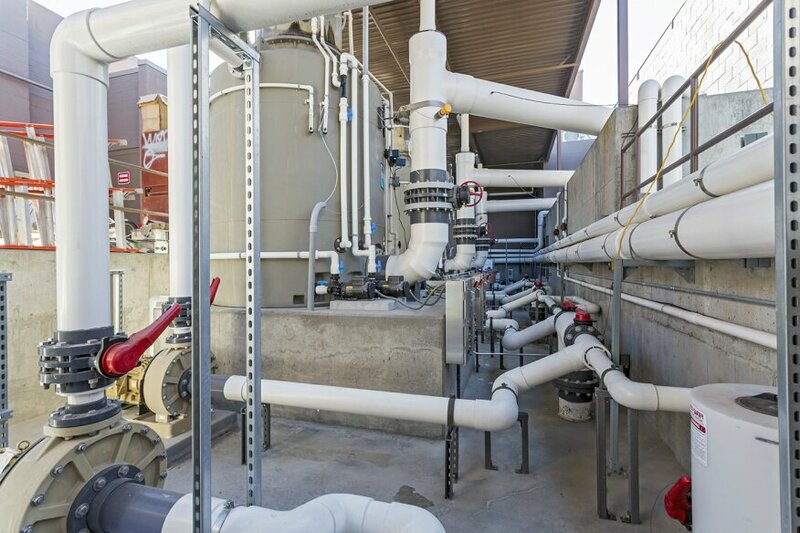 Heaters and chillers maintain the water within a constant temperature range, and a gravity-feed circulation system helps mitigate suction entrapment risks. Waterproofing took on an even more important role than usual. With salt levels of 35 ppm, the water is corrosive to any metal it contacts — including rebar. Making the shell watertight was vital. But these pools are occupied around the clock — by the dolphins — so refinishing them would cause a complete disruption. Fletcher and structural engineer Lanny Porter, of Porter Engineering, found a way to waterproof the structure without the need to refinish. The shell was shot with a denser, 5,000-psi concrete mix that would allow less water migration. Additionally, an integral sealer was included in the concrete mix. But aesthetics needed to be accounted for, as well. Presidential hired professionals who finish skateboard ramps to make the surface as smooth as glass. Colorful acrylic stains were used in hues reminiscent of the ocean. The team expects this product to remain colorful for 15 to 20 years. For humans only, the grounds also include a regular public pool with a viewing window for dolphins and people to check up on each other. Two 200-square-foot spas provide relaxation for the guests. 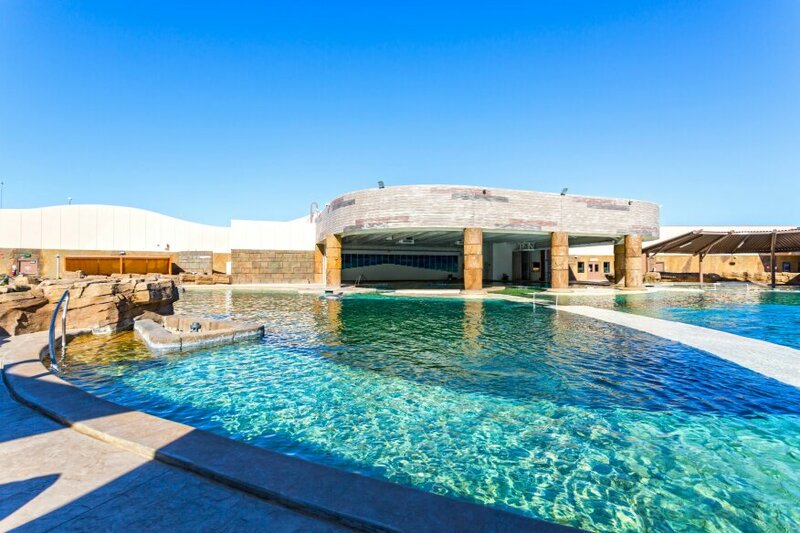 Building at Dolphinaris Arizona presented Presidential Pools the opportunity to become associated with something historic. With six such resorts in Mexico, the park owner was breaking ground in the U.S. But all the others are located by the sea, so they can use the ocean’s salt water. Here, the Mexican company brought dolphins into arguably the most relentless desert the U.S. has to offer. In addition, the property was being developed on a Native American reservation. That meant plenty of controversy. When word of the park got around, protests took place and a petition campaign garnered more than 100,000 signatures. The resort was allowed to move forward. But the city of Scottsdale, Ariz. wasn’t the only one to perform a conscience check — Presidential did, too. Upon hearing of the job, Ed Fletcher, vice president of the pool builder’s commercial division, ran the idea past Presidential CEO Tim Murphy. “I thought, ‘Wow, very interesting, but a little concerning,‘” Murphy says. He met with the person who manages the land on the reservation, which already housed a number of amusement and sports properties, to learn how development worked there. He wanted to find out about such issues as lien rights, the legalities of ownership, and employment laws. Murphy knew his company would erect its signage during construction, so it was important to make sure everything was up to his standards. And he wanted reassurance that building the pool would not take away from his company’s good-citizen status. “I wanted to make sure this was a good thing to do,” Murphy says. “We were happy to do the project after this process."